1. Autley usb wifi adapter with the latest Wi-Fi technology - 802.11ac, 433Mbps on 5GHz band is deal for gaming online and seamless HD video streaming. 3. Works with any wireless router. 4. AP mode supports to create a wireless hotspot when the wired internet is available on your computer. 5. Mini size, lightweight, convenient to carry. 1. The wifi adapter can work at 5GHz bands only if your wireless router supports 5GHz bands. 2. If you can't use the driver CD, please download drivers from:Windows: https://goo.gl/Uvewod OR Mac: https://goo.gl/uJDwQY . For any question, please contact us by Amazon message or customer support email (support@autley.com). Data Transfer Rate: Up to 150Mbps at 2.4GHz bands and 433Mbps at 5GHz bands. High Performance: This wifi usb adapter can adjust the speed of the transmission depending on the network situation, making it perfectly suited for online gaming and HD video streaming. Compatible Operation System: Autley usb wifi adapter supports Windows 2000/XP/Vista/7/8.1/10(32-bit/64-bit), Mac OS X 10.4-10.11. Please check the driver link in the detail page or contact us for help. 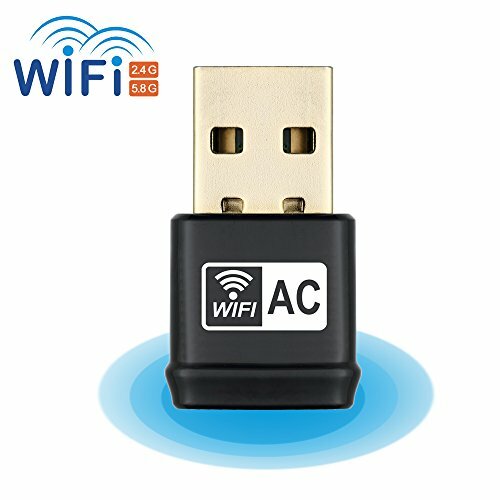 Easy to Use: Install drivers, insert this wifi adapter into your computer, choose station mode(work on Windows and Mac) to connect to existing wireless network or AP(access point) mode(work on Windows, not for MAC) to establish your wireless LAN network, which provides Wi-Fi to your phone, tablet, laptop etc. Our Service: With Autley, a 30 Day Money-back Guarantee and 1-year warranty are available for all products. If any concerns, welcome to contact our friendly customer service team. If you have any questions about this product by Autley, contact us by completing and submitting the form below. If you are looking for a specif part number, please include it with your message.